Culture & Co is a dedicated French bookstore in Dubai, established in April 2006. Stocks books in French, French language learning books and courses, albums, cds, and French educational materials. Culture and Co new location (from 20 February 2010?) Al Nasr Plaza building, Oud Metha. On Road 10 (parallel to Umm Hurair Rd), after Al Nasr Cinema location and Al Nasr Club in direction of Oud Metha Road. Near the Lycée Français International AFLEC Dubai (see location map). Shop size 200 sq meters. New telephone number +971-4-3573603. Old location API Tower, Sheikh Zayed Road, tel +971-4-3313114, fax +971-4-3313116 (not be valid after February 2010). Opening hours 0900-2100 (9am-7pm) 0830-1800 (8:30am-6pm) Saturday to Thursday, closed Friday. New location in Oud Metha opened with the support of the International French Bookstore Association (L'Association internationale des libraires Francophones - AILF). Opening ceremony of the new book shop attended by French Council General in the UAE, Mrs. Nada Yafi. Funds raised at opening ceremony to help rebuild French Bookstores in Haiti. Educational material and French books not available instore can be ordered. Culture and Co owner is Renata Sader. Culture and Co contact details: Postal address PO Box 502104, Dubai, UAE. Email: info@culturecodubai.com (or maybe culture_co@ hotmail.fr, or renata.sader@culturecodubai.com). DCCI directory and other sources list Culture & Co with PO Box 74832? Abu Dhabi Culture & Co bookshop opening date 01 November 2008, opening hours 0900-1900 (9am-7pm)? 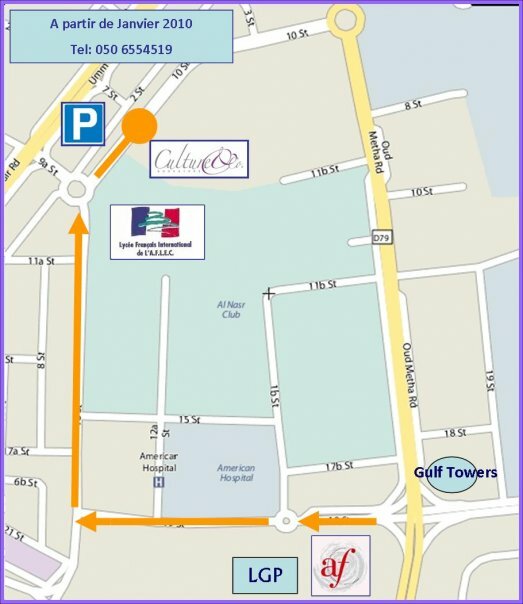 Located at the Alliance Francaise Abu Dhabi (l'alliance française d'Abou Dhabi)? The largest bookstore in Dubai and the UAE? Has a relatively large French section (and Arab, Chinese, German, Japanese books). Located on top floor of The Dubai Mall, overlooking the Dubai Fountain (but you can't see it anymore from the bookshop). Large Magrudys store in Dubai Festival Center shopping mall is the best Magrudy's shop to go to for French books. Ibn Battuta Mall and Jumeirah locations also have a few French books. www.amazon.fr (it's in French of course, you can probably get a reasonable selection from www.amazon.com in the USA or www.amazon.co.uk in Great Britain). www.fnac.com - unknown but suggested on the website of the Lycée Louis Massignon d'Abou Dhabi. www.dubaifaqs.com/bookstores-french-dubai.php (PDF and print version).